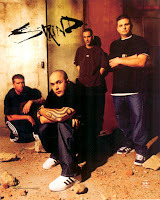 Staind is part of the post-grunge, nu-metal generation coming out into the light in 1995. Having released over 7 albums to date, this track is from their 1999 second album - Dysfunction. Staind displays an obvious Alice in Chains connection: vocal harmonies, melody lines, guitar lines but to dismiss Staind as purely an Alice in Chains clone is not to give justice to the work presented in Dysfunction. Dysfunction is a alternative grunge blend - a swirl of Alice in Chains meets Coal Chamber, it flirts with Tool and Soundgarden, it's best friends with Korn and Deftones, it's Creed and Stone Temple Pilots. Original? Yes and no - Given that last sentence, a little stretch on the imagination but they're good at it. The music is driving, punchy, heavy and might make you exceed the speed limit while listening on the way to work. "Home" as expected was a slow rising radio hit. Bottom line: if you're a fan of any of above mentioned bands, check out Staind and this killer track.